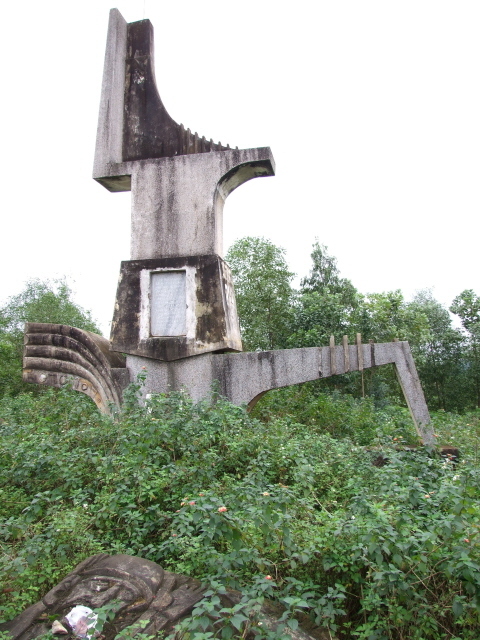 An area in Central Vietnam which used to be the "demilitarized zone" (DMZ) between North and South Vietnam. In the Vietnam War this became anything but demilitarized and was in fact where some of the fiercest battles of the whole war took place. (It shares the irony of discrepancy between reality and its name with another, still existing DMZ: that at the border between North Korea and South Korea). 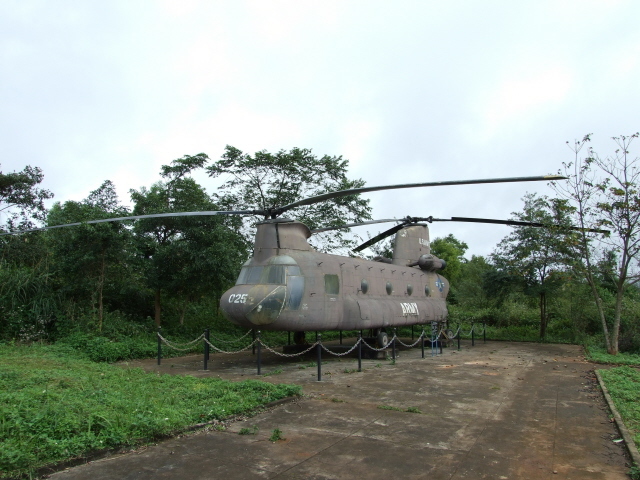 Today the former DMZ is best visited on a special tour by car that goes up into the Central Vietnamese highlands and past various relevant sites, including the former Khe Sanh US base (now a museum). Some major sites in the DMZ area are given separate entries here (see under combinations), but can easily be incorporated into a two-day DMZ tour. 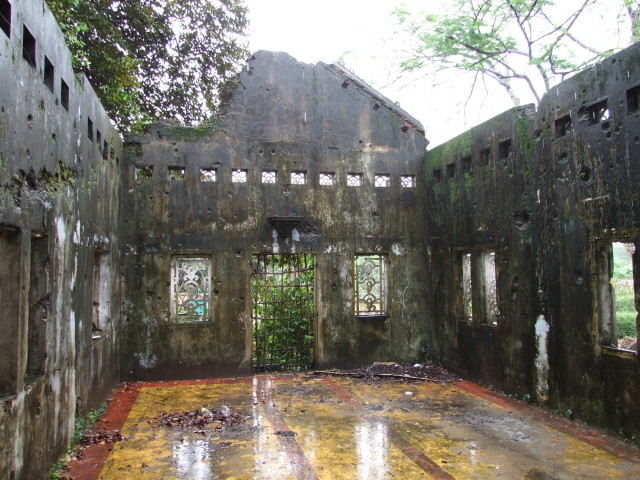 What there is to see: The tour, when starting it from Hue, first passes through various small towns, and occasional stops are possible at war sites such as a ruined school and church buildings (Truong Bo De and Na Tho Long Hung, respectively), riddled with bullet and shell holes and still blackened from fire. 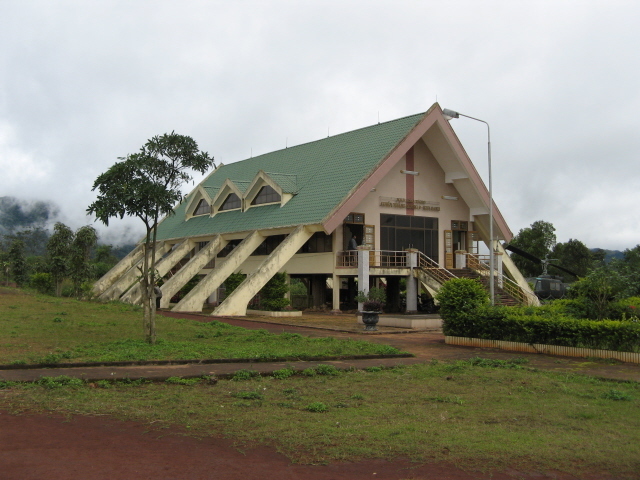 You also pass the odd rusting tank wreck and numerous monuments and war cemeteries. 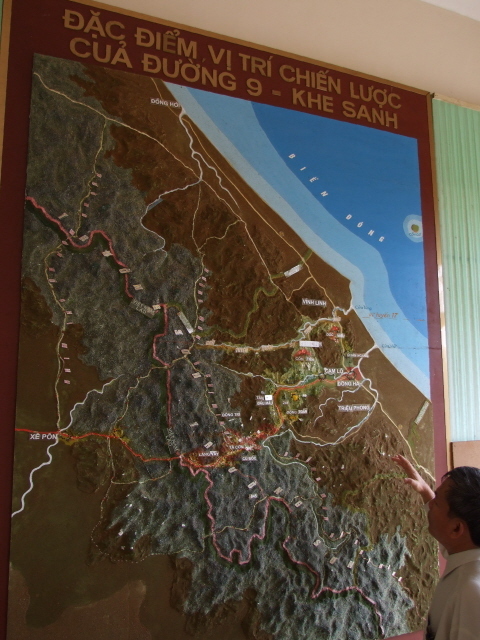 Eventually the route goes up into the mountains – and some of these already have evocative names from the Vietnam War days (e.g. "Hamburger Hill", "The Rockpile") but other than that there's not much to see at them. 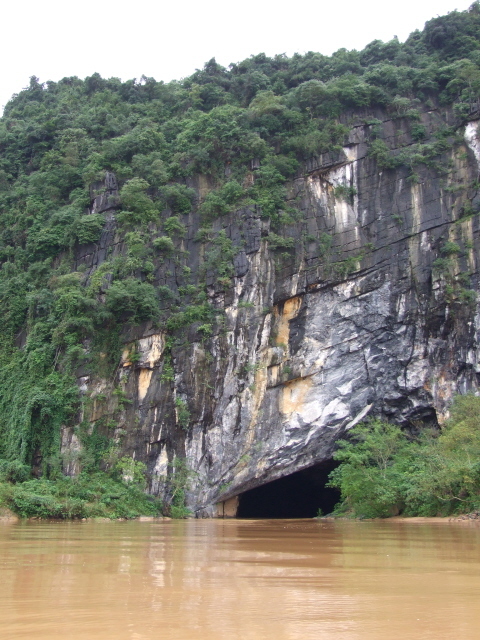 Similarly, part of the route allegedly goes along (or merely crosses) sections of the legendary Ho Chi Minh Trail, but of course nothing of it can really be seen. 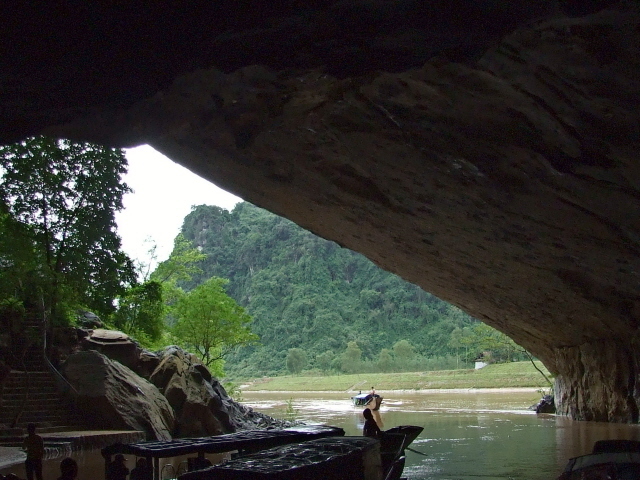 It's more about the mystique of it having been somewhere here – the modern highway these days also bears Ho's name (but it's of course NOT the Trail nor even following its course, even though this is sometimes claimed – most of the trail was further west, and on Laotian territory). More concrete is the Dakrong Bridge – this was originally built with assistance from Cuba. There's a small memorial, but, again, not much of great drama to see. That changes at the former Khe Sanh combat base and airstrip. 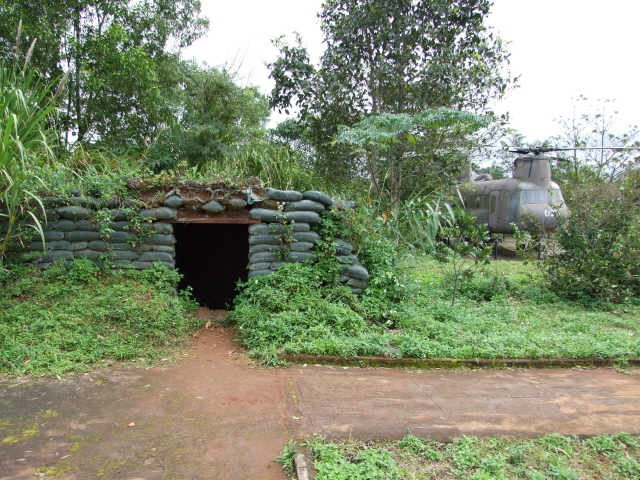 This was the site of a siege and major battle when the Americans amassed troops and gear to engage the North Vietnamese in battle – they did enter into it, but only as a "diversion" for the Tet Offensive. It was still a real battle, though. The USA later, though not actually defeated at Khe Sanh, had to give up the base. 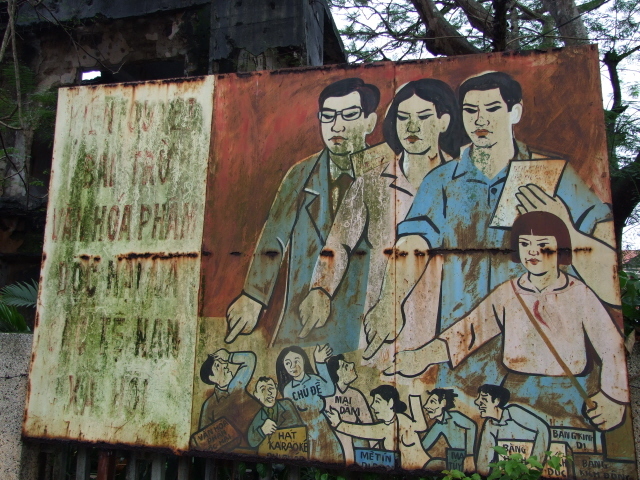 On their way out they blew up everything that could otherwise have been of use to the North Vietnamese army. 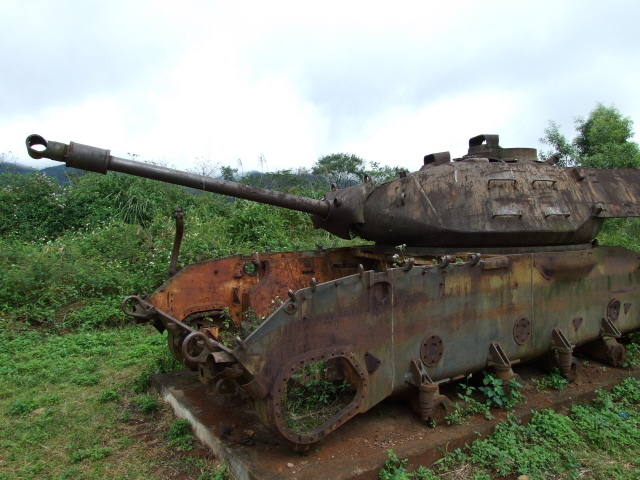 Today, the Khe Sanh site is marked primarily by a museum and monument. 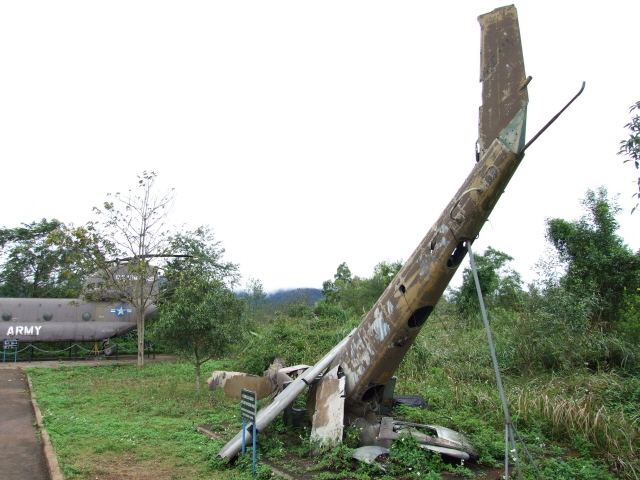 Open-air exhibits include more wrecks of American tanks and rusty old cannons, but also the hulks of two typical helicopters, including a still relatively intact C-47 Chinook double rotor heavy transport and "gunship" chopper. (All brought here from other parts of the country, as – remember – the US Army didn't actually leave anything behind.) Inside, the museum is a bit faded and unrevealing. Exhibits include more old military gear on a smaller scale, several charts, maps, a diorama and many photos. There is scant English signage and explanatory text, but you won't learn all that much here. What is more eye-catching here is the very socialist decoration and artwork. Despite the place being regarded as one of the highlights of the former DMZ, there were hardly any other visitors when I went (late December 2008), just two other tourists wandering around. 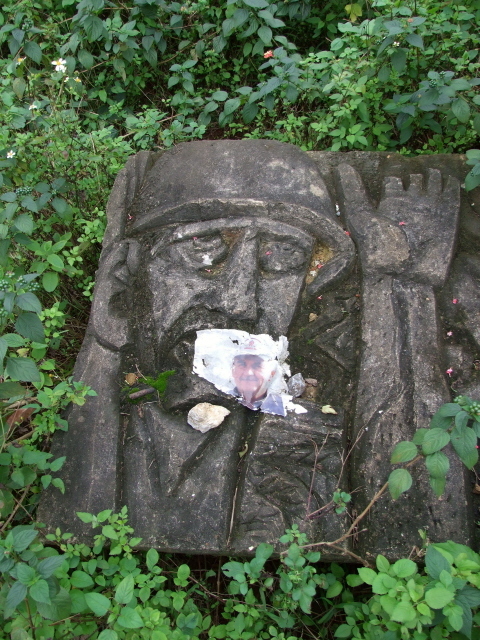 Apparently there are also some vestiges of the former airfield of Khe Sanh to be seen nearby, but I wasn't shown this – and certainly had no intention of wandering off in search of this on my own. 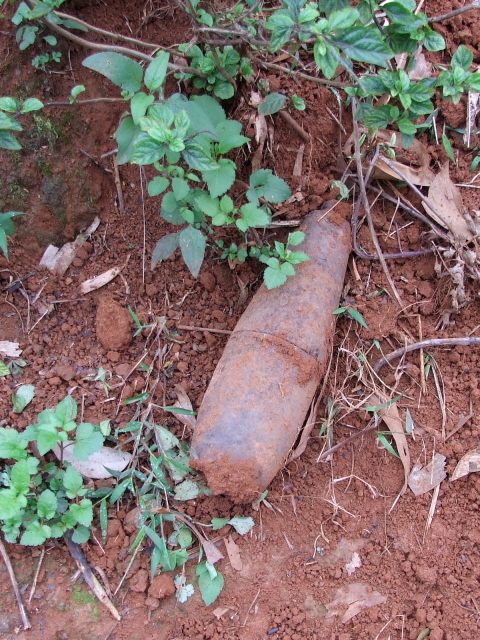 NOTE: the area is still riddled with UXO and landmines. Straying off well-marked safe paths, let alone handling any strange objects lying around, can be lethal. Around the Camp Carroll site large peppercorn plantations make for a somewhat bizarre contrast. In general, the whole area is a lot greener today than it would have been back then. 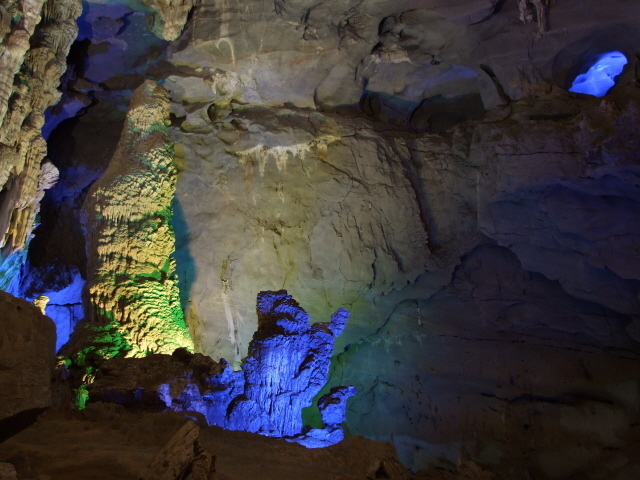 Locations: 50 to 80 miles (80-130 km) north-west of Hue, Central Vietnam. Access and costs: not easy, at least not independently, guided tours can be expensive. Details: I really recommend going on a DMZ tour with a driver and guide, as finding your way around independently can turn out to be a bit of a nightmare. And there's hardly any public transport anyway. 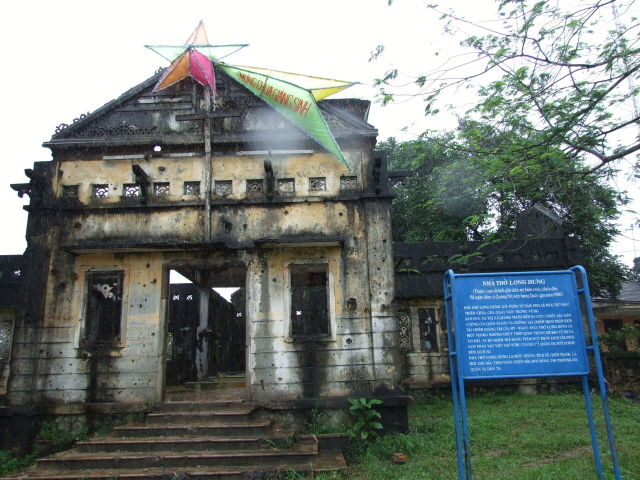 The city of Dong Ha is closer to the DMZ, but Hue has more tourist facilities and makes a better base for tours. If taking a two-day full tour you'll need to stay overnight somewhere closer to the DMZ (the round trip to all the sights and back to Hue cannot be done in just a day). Time required: a day if you just want to see what's been described above. However, it makes much more sense to extend the tour to two days, and take in the sights closer to coast as well. Much of the time will be spent just driving about between the various individual sites. 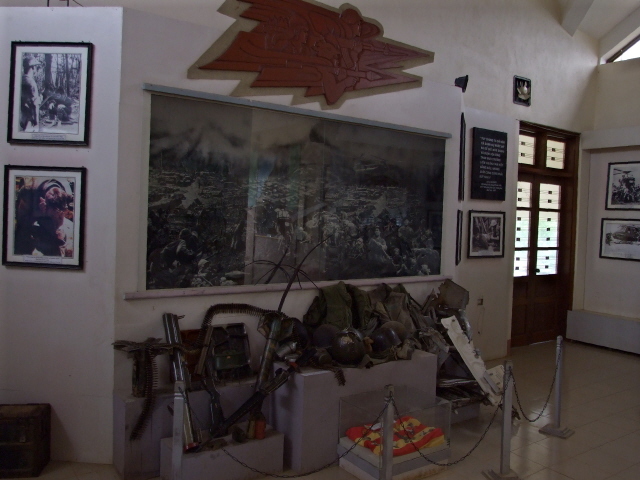 Combinations with other dark destinations: almost obligatory, when doing a DMZ tour, is to make sure it also takes in Hien Luong Bridge (with is monument and museum) and the Vinh Moc tunnels. 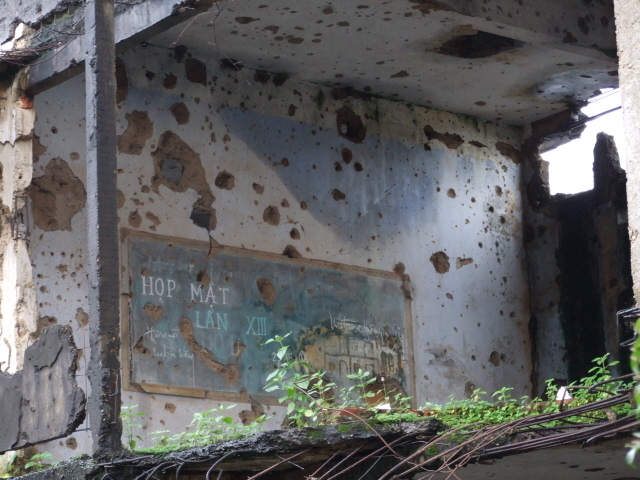 Hue, the likely base for DMZ-tours, also played a major part in the Vietnam War, when the North Vietnamese briefly captured it during the Tet Offensive of 1968, before being driven out again by the US troops. It was a nasty battle of street fighting and snipers (gruesomely depicted in Stanley Kubrick's film "Full Metal Jacket"). 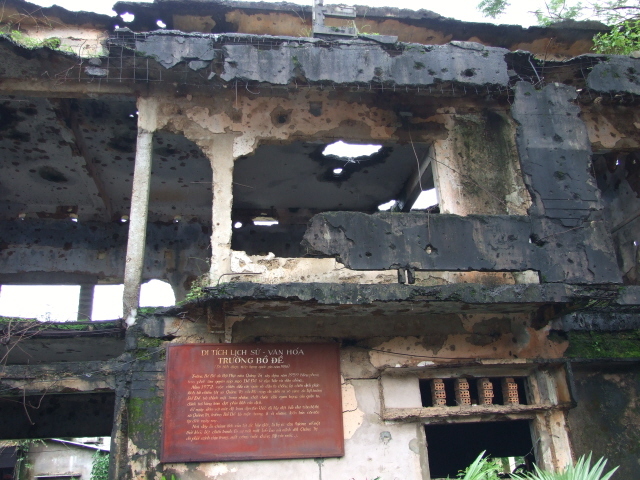 Hue was also the site of what is considered one of the Vietnamese's worst war crimes, committed during their four weeks holding the city. It appears to have been a purge in which apparently several hundred (if not thousands) of US sympathizers, and other political "enemies" were massacred (although even more died in US shelling in retaliation). Evidence from excavated mass graves suggests (though not conclusively) that the victims were also tortured. In a way then, it is a frequently adduced as a kind of Vietnamese counterpart to the My Lai massacre committed by the US less than a year earlier. But unlike the latter, the Hue massacre is of course not commemorated and commodified for tourists in Hue itself, so you'll have to make do with your imagination when there … which you'd have to anyway, as the "Hue massacre" is so much less documented. For destinations beyond Central Vietnam, see Vietnam in general. Combinations with non-dark destinations: Hue can be used as the base for the DMZ tour, and as it is itself a major tourism destination, this makes for a perfect combination. Hue was the former imperial capital of Vietnam, and is full of important historical relics. 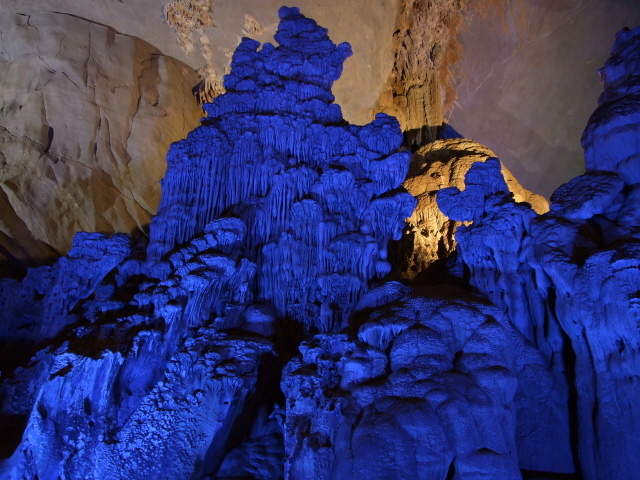 A major natural sight that can easily be built into a two-day DMZ tour is the famous Phong Nha Cave. 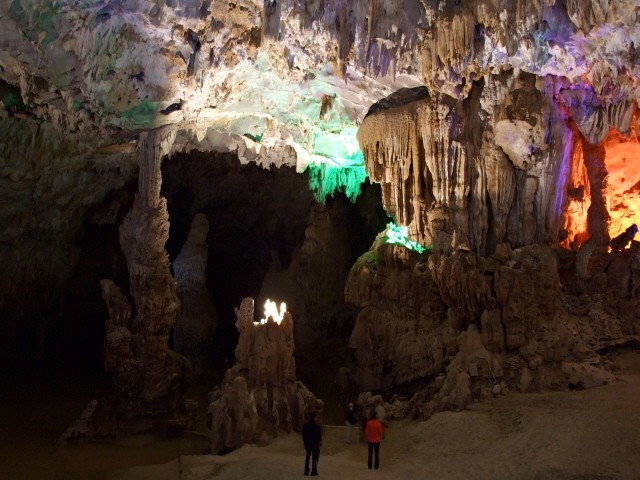 It is indeed massive and impressive, though the rather garish coloured lighting is a bit over the top for my taste (I prefer my caves more authentic and only dimly lit).